Whether you&apos;re dashing through Mario Kart on MupenGUI, binge-watching Silicon Valley on Cinema, or writing your next novel on Quilter, you need to relax your body every once in a while. 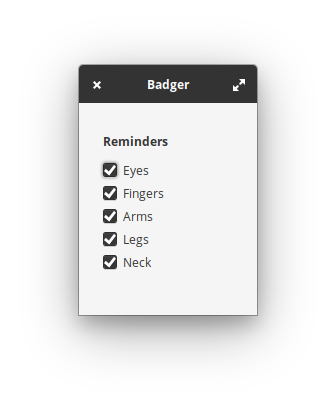 Badger helps you do exactly that. It reminds you—or should I say, badgers you—to destress yourself and rest your eyes and muscles. Get Badger and more on elementary AppCenter, the open, pay-what-you-want app store for indie developers. Every app is open source and has been reviewed and curated by elementary to ensure a native, privacy-respecting, and secure experience.